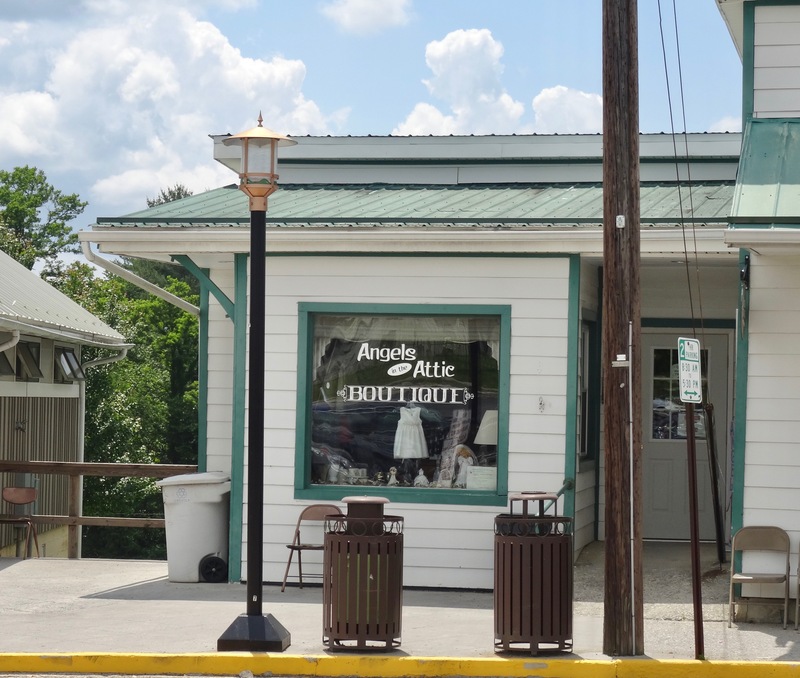 What’s up in the Attic | Angels in The Attic | A ministry of Floyd County Angels Ministries, Inc.
SWITCH OF CLOTHING TO SPRING AT ANGELS IN THE ATTIC STORE. ALSO A SWITCH TO LATER TIME CLOSINGS ON FRIDAY EVENINGS. EASTER BASKETS DECORATED, PRE-MADE, NOW AVAILABLE. Just a reminder: We have switched our clothing from winter to summer. In addition to our regular supply of tops, shirts, tees, shorts, jeans, and sandals, we have bathing suits for $2.00. (children’s: $1.00) Get ready for swimming and sun bathing. We have bed linens galore. All sheets, regardless of size, flat, or fitted, are $1.00 each. Pillowcases are 50¢ each. Keep a couple of sheets on hand to cover tender seedlings and plants, in the event of a hard freeze. Starting April 12th, our Friday hours will be extended. New hours for Fridays only will be 9 am to 7 pm. These hours will continue through Christmas. We have pre-made, decorated Easter baskets, filled with toys, candies, and other cute goodies. Our thanks go to The Floyd Baptist Pre-School for making these baskets. They will range in price from $5.00 to $7.00. Also be sure to stop by the Angels Furniture Store on Needmore Lane, on the same land as the Angels Donation Center. The Angels Boutique is open for unique gifts, especially selected by volunteers doing the sorting as warranting more value to collectors. We would like to give a big shout out to Young Life today for coming in and helping us!!!!! Those ladies did an awesome job. With infectious enthusiasm. ANGELS IN THE ATTIC ANNOUNCES THAT IT MUST BE SPRINGTIME IN THE AIR, AS IT IS “OUT WITH THE WINTER CLOTHING, IN WITH THE SPRING CLOTHING” ON THE RACKS. ALSO, EASTER BASKET MATERIALS ARE ON DISPLAY. PROM DRESSES ARE NOW ON DISPLAY FOR AN UNBELIEVABLE $5.00 !!! The “changeover” is coming this Friday, April 5. Gone will be our fall and winter wardrobes, and in its place, our spring and summer garments and shoes will appear. Think shorts, capris, tee shirts, light blouses, and sandals! A group of dedicated volunteers will make this switch happen. Are you ready for a change? Don’t miss the first day of our changeover! Our Easter merchandise has been set out. You will find decorations, plastic eggs, baskets, Easter grass, and more. Most of these items will be on the table by the front window. Also on April 5, look for our prom dresses to be on display. They will cost $5.00. You may also find pretty shoes ($2.00 a pair) in the shoe room, to accompany your dress. Or, if you have a rich relative, you can check out a Macy’s sale online where a prom dress has a recent price cut to $107. Don’t forget the Angels Furniture Store on Needmore Lane when you are doing spring cleaning and redecorating. Some items look like new. Other items are very low cost and can be upscaled by a crafter with some artistic paint. $$ REVISED $$: NOW IT IS A THREE-DAY BAG SALE AT ANGELS IN THE ATTIC STORE ON THIS FRIDAY MARCH 29, 2019, THEN AGAIN SATURDAY MARCH 30 AND ONCE AGAIN ON TUESDAY APRIL 2. SO EVERYBODY GETS AN OPPORTUNITY. On Friday, March 29th, also on Saturday March 30 and again on Tuesday April 2, Angels will be having a “bag sale”. This means that you may fill a plastic grocery bag (NOT a paper one, but like the plastic ones provided at the checkout at Food Lion!) with any clothing or shoes that will fit! ONLY clothing and shoes are in this bag sale. The cost will be only $2.00! Check us out on these days, come in, and have some fun! This sale does not apply to the Angels Boutique nor the Angels Furniture Store. We will be having a “changeover” soon, midweek.. Gone will be our sweaters, boots, and coats, and in their place will be our spring and summer apparel. This new clothing will appear on Friday April 5th. Mark your calendar. Angels declares, with a fair bit of confidence, that Spring really is here, and will stay. Are your thoughts turning to Easter? We have lots of baskets for sale. Come in and browse, and create your own Easter basket. Baskets range in price from 50¢ to $2.00, depending on size. Your kids will enjoy making their own basket in anticipation of the holiday. With springtime here, many people will be putting potted plants on decks and doorsteps. Keep in mind that Angels has an abundance of saucers that are excellent underneath your planters. They are only 10¢! Bring a few dimes, plus some pennies for the sales tax. See you soon at Angels. Happy Spring! – If you are thinking about spring (and who isn’t!) and getting in shape again, we have lots of athletic wear at The Attic Store. You may find just what you need for your workout. – If you knit or crochet or do crafts, you will find three big tubs-full of yarn of all colors in the fabric section. It is located in the front room. – Remember, scrubs are always $1.00, tops or bottoms. For those of you unfamiliar with the term, it is a hygienic outfit used by those in the medical profession. These run about $25 a set if bought new, but Angels is pleased to give our caretakers a big break. – We have a small area of party items in the front room. In it you may find: wrapping paper, gift bags, party hats, confetti, and number candles for a birthday cake. All items are 25¢ and up. – In regards to The Angels Furniture Store, please be aware that we can only accept working appliances (stoves, refrigerators, washing machines, etc.). Your cooperation is appreciated. No one wants to purchase a non-working appliance, and we do not have the technicians with the skill to fix them, nor the parts. The store that sells you a new one will usually take a non-working one away. Otherwise, take them to the Transfer Station. – If you have friends who do not use Facebook or websites, they can still keep up with the news from Angels by referring to The Floyd Press, in section B, in a column titled “The Thrifty Angel”. YOUNG LIFE PITCHES IN TO HELP THE VOLUNTEERS AT THE ANGELS IN THE ATTIC STORE. AWESOME JOB DONE BY THESE YOUNG FLOYDIANS. We would like to give a Big Shout Out to Young Life for coming in today and giving back. You done an Awesome job, and we are so very proud of you…. 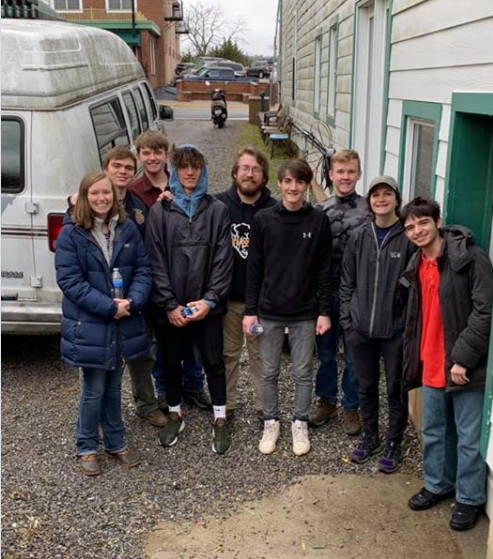 Also appreciated is a work day completed last year for both the Angels Boutique and Angels in the Attic, by another group of Young Life volunteers. A great organization. FABRIC AND LAMPS GO TOGETHER! A LARGE SUPPLY OF FABRICS NOW AVAILABLE AT ANGELS IN THE ATTIC STORE, ALONG WITH A LARGE SUPPLY OF LAMPS FOR LIGHTING UP YOUR CRAFTS WORK. NO MORE SQUINTING. THE PRICES ARE ALWAYS VERY LOW. Our fabric department is overflowing! If you are looking for a project, and you like to sew, check us out. We have solids and prints, which include cottons, wools, linens, some silk, and some upholstery material. We also have an abundance of lamps at the moment. They are in the front room. One of them might be just what you are looking for. At this time, we have an abundance of dishes. Our prices are so low that they can be competitive with paper products for your party. Some customers in the past have bought extra plates for a big party, then re-donated them back to Angels! Think of the Attic if someone you know is having a big party or setting up house-keeping. Since this article is turned in four days before publication, we can never guarantee that items mentioned here will still be available. As of this writing, we have many small appliances at the Attic. A few of the items I noticed are: an electric griddle, several toaster ovens, a regular toaster, a rotisserie, a coffeemaker, and a crockpot. Come in and browse. Read The Floyd Press each issue for an article in section B about the happenings at the Angels in the Attic. So if your internet and cellphone fail, you can keep up with the news. –We have a totally fresh assortment of books…for adults and children, fiction, non-fiction, and self-help. Check us out for your wintertime reading, at very low prices. –We have had a large supply of new items donated. They include sets of dishes, sets of glassware, and nice clothing. It’s worth a look! –In the children’s room, there is an extensive collection of dolls. These will be found on the top shelves. –Are you envisioning your family doing jig-saws, playing board games and checkers by a roaring fire this winter? Well, we can’t provide the fire, but we do have games! Here are some samples: Lots of jig-saw puzzles, plus Clue, Trivial Pursuit, Checkers, Horseopoly (? ), Pictionary, Balderdash, American Idol, and The Gender Gap. Branch out! Try a new game! –Our sales of donated goods for the past 12 months are up a lot compared to the year before. Thank you, Angels shoppers, for providing more funds for local charitable organizations to feed the hungry, aid the needy, help children and the elderly, and provide for public safety. If you are from out of the area, you can find us with your GPS at 210 S. Locust St, Floyd VA 24091. VOLUNTEERS APPRECIATED; VOLUNTEERS NEEDED; CURIOUS THINGS FOUND IN ATTIC STORE. 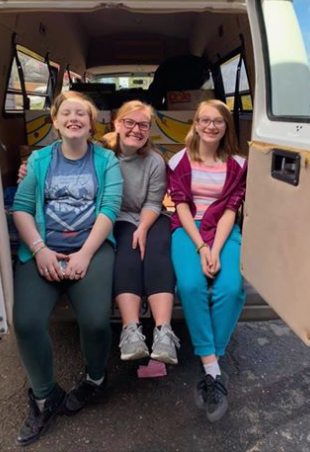 We sometimes forget that without volunteers, Angels in the Attic, the Angels Furniture Store, the Angels Donation Center, and the Boutique could not function. Our volunteers always deserve a huge “thank you” and a pat on the back. We’d especially like to thank those volunteers who worked so faithfully at The Christmas Store for three months last fall. Volunteers, as you know, come and go; we acquire some, and we lose some. Currently, we are in need of volunteers Wednesdays and Fridays at The Donation Center and the Furniture Store. If interested, contact Gennell at the Angels in the Attic Store during store hours. *2 irons, $2.00 each; *a brass and glass chandelier, $5.00; *a chafing dish, $2.00; *a glass Corningware 9” x 12” baking dish in good condition, $5.00;* a heavy, lovely, angled glass vase, $1.50; *2 glass carafes @ 25¢ each (in case the one for your coffee-maker gets broken!). It should also be mentioned that we have piles of pocketbooks and purses. If you are willing to search and dig around a bit, you will probably find just what you are seeking. They are only $2.00 each.